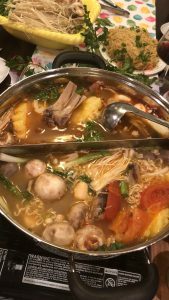 Cold weather calls for HOTPOT. 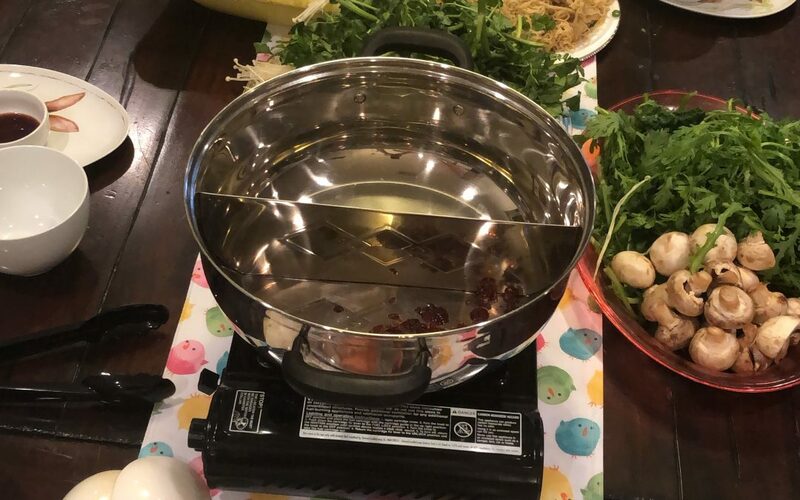 I think HOTPOT is so easy to make and my family so enjoy them…its just the PREPPING takes so long because they have so many different items that goes into a GOOD HOTPOT. 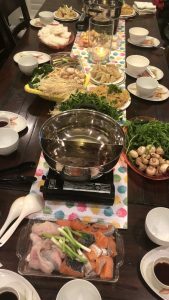 My kids love eating hotpot because they can cook it themselves and add whatever they LIKE. I always make 2 separate pot because the kids don’t like it spicy so I make their broth mild WHILE our pot is SPICY. 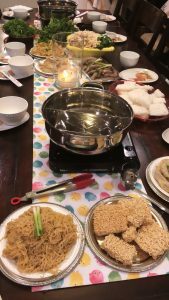 Whenever I have a large group of friends over at the house for a little get together…I like to do HOTPOT ..its kinda like an ASIAN fondue to me. Everyone can sit around and enjoy a big BROTHY POT of food…and usually there is something for EVERYONE to EAT and enjoy. Entertaining with HOTPOT is very simple and the prep is easy. The only thing you have to make is the BROTH. Literally, you can just make a simple one with chicken broth and add the soup seasoning and WAAAALAAAA you have a broth for HOTPOT. The BROTH is the KEY to a GOOD HOTPOT!! IT DOESN’T take long to on the stove to cook or simmer. The ingredients are all very FLAVORFUL. The best part about HOTPOT is that you can have more than one BROTH or you can keep it simple and just do one BROTH. What you will need is a table burner and a DEEP POT. At the Asian market they sell the POT that has a separation in the middle where you can have more than one BROTH. Vegetables and MEAT ideas that are good for HOTPOT…but you can basically add whatever you like. In a large STOCK POT put in the lemongrass, ginger root, turmeric root, tomato, and garlic with 2 tablespoon oil.. about 7 minutes…you want to get that nice fragrant, Next, pour in the 4 container of chicken broth. Add in the rock sugar. 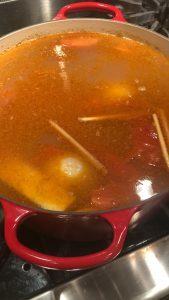 Then add 2 TABLESPOON of the tom yum seasoning (optional) .Once the broth start to BOILED ….turn heat to low and put the lid on. SEASON according to taste. Simmer until you are ready to ladle into the individual hotpot. I don’t add the SPICY tom yum jar to the broth until I have ladle it in the individual pot because my kids don’t like their broth spicy. I have that pot that is divided in the middle so you can put one side spicy and leave the other side mild for the kids. You can also leave the both side mild and have the individual add the spicy to their own bowl. I actually like to dip my meats, noodles, and vegetable in some soy sauce and chili mixture.